Over 300 students from 48 East Coast colleges and 9 states converged on the University of Maryland, Baltimore County, on Saturday, October 14, for the Twentiethth Annual Undergraduate Research Symposium in the Chemical and Biological Sciences. 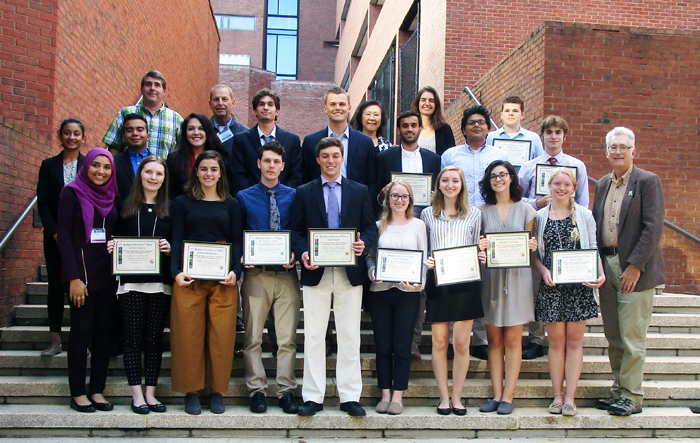 University of Delaware students did very well receiving 6 first place awards (Michael Testa, Alexander George, Chelsea Lee, Alexander Stubbolo/Camryn Bernheimer, Caitlyn Dogherty, and Erin Jackson) and 5 second place awards (Jessica McAnulty, Rachel O'Sullivan, Shrey Patel, Kyle Plusch, and Lauren Reich) in several Biology or Biochemistry and Molecular Biology groupings. 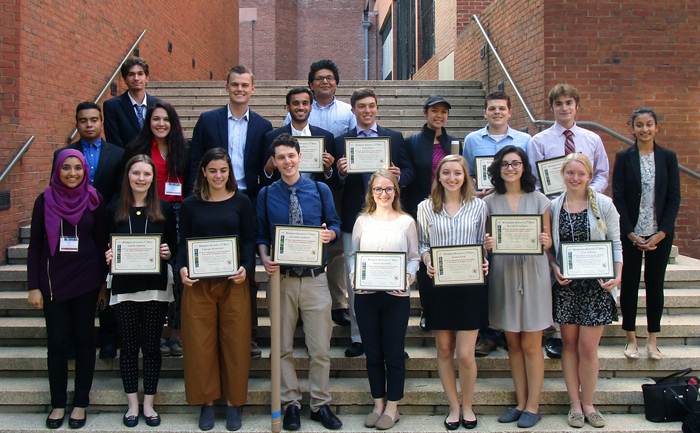 Other University of Delaware students who participated were: Adrienne Fraczkowski, Tessa Jarvis, Pragyan Khanal, John Nixon, Hira Peracha, Juan Ruiz, John Vaile, and Dominic Villalba. Faculty with the group included Carlton Cooper, Deni Galileo, Seung Hong, Gary Laverty, Ben Rohe, Jessica Tanis, and Hal White. Back Row: Dr. Deni Galileo, Dr. Gary Laverty, Dr. Seung Hong, Dr. Jessica Tanis, and Michael Testa. Middle Row: Anita Rao, Juan Ruiz, Tessa Jarvis, Dominic Villalba, John Vaile, Shrey Patel, Pragyan Khanal, and Alexander George. Missing: Dr. Carlton Cooper, Adrienne Fraczkowski, Chelsea Lee, John Nixon, and Ben Rohe. Back Row: Dominic Villalba, Pragyan Khanal. Middle Row: Juan Ruiz, Tessa Jarvis, John Vaile, Shrey Patel, Kyle Plusch, Chelsea Lee, Michael Testa, Alexander George, and Anita Rao. Front row: Hira Percha, Caitlyn Doherty, Camryn Bernheimer, Alexander Stubbolo, Jessica McAnulty, Lauren Reich, Rachel O'Sullivan, and Erin Jackson. Missing: Adrienne Fraczkowski, John Nixon .